Cute little crabs by Cepia 2011: Bimini, Turks, Trinidad, Tobago. What I like about Xia Xia habitats is that they are very colorful and very entertaining. It's kind of candy colors – very light, rich, almost pastel, but still bright and catchy. All playsets are different, but you can connect them to each other easily. 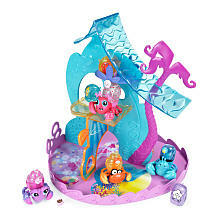 Also each habitat is very great starter set, but all together they made really funny and vary Xia Xia world. My favorite to start from is Xia Xia Confetti Cottage, it's small but roomy, there are two levels and several rooms. 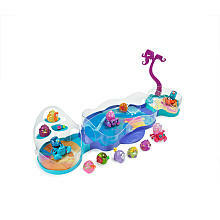 Xia Xia Copacabana Playset is a house with backyard, it's also great to start from. And the last but not least is Xia Xia Rio de Trio Village Playset, the biggest and most entertaining. It's several rooms and swimming pool connected to each other. Hope you like this new Xia Xia toys and check back soon for more news and reviews. Hey, Cepia toys fans, welcome to the Xia Xia Pets blog, join our cheerful community, share your thoughts, learn about new toys and have fun! 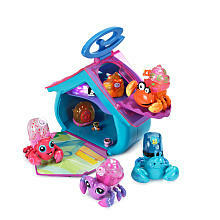 Are the Xia Xia Pets need batteries? What are Xia Xia little friends? Is there an official website for Xia-Xia Pets? What Xia Xia Pets Blog is about? © xiaxiapets.blogspot.com. Travel theme. Theme images by imacon. Powered by Blogger.